One of our jobs as caregiver for a person with dementia is to be creative, innovative, and resourceful. Activity can be found everywhere. What we often consider chores can be beneficial activities. Sorting socks, folding towels and putting away silverware not only provide stimulation but make a person feel he is contributing. Such chores can reinforce to a sense of purpose and worth. Almost any activity can be modified from one that is not an age- and stage-appropriate activity for Alzheimer’s disease to one that is. As an example, doing the laundry is a fairly complex procedure. Those things that need cleaning need to be gathered and separated. Once the clothing and detergent is added to the washer, the correct setting must be dialed on the machine; and so on. Doing the laundry is both age- and-stage-appropriate for someone without dementia, or with mild dementia, but can become difficult as dementia progresses. Doing the laundry may eventually become folding laundry and putting it away, then folding towels, etc. Keeping those in your care active will improve their quality of life and will also make your job easier and more rewarding. It is very important to keep activities stage-appropriate, or the activity is likely to become frustrating, defeating the purpose altogether. Age-appropriateness is the qualifier that often goes with stage-appropriateness, but it is a little trickier to characterize an activity as age-appropriate. A stage-appropriate activity is one that an individual is able to do. An age-appropriate activity, on the other hand, is one that is designed to meets the needs and appeal to the sensibilities of a person who has attained a certain level of maturity, a level that is tied closely to chronological age. With Alzheimer’s disease or most other dementia, this tie to chronological age goes out the window. The Lock Box pictured here was designed as a developmental activity for children, but the man shown with it is enjoying the challenge. As long as he (not the caregiver) doesn’t find an activity demeaning it can be considered appropriate, even if it is not age-appropriate in the strictest sense. If he enjoys doing it and benefits from it, it is a good stage-appropriate activity. Conclusion: make stage-appropriateness the primary aspect against which to judge an activity. 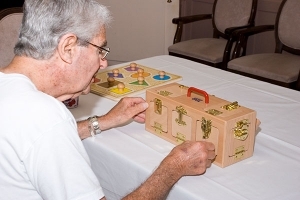 Doing something everyday is the best alternative to keeping Alzheimer patients Active. Ir can be any small, little, helpful thing. Ir all works to keep everyone hospitable.